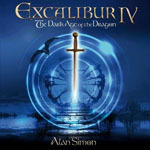 Share the post "Album review: ALAN SIMON – Excalibur IV The Dark Age Of The Dragon"
The first reference I saw to Alan Simon was the credit on Sonja Kristina’s recent anthology – it’s the track that’s also included here called ‘The Passion’. Then an Alan Simon compilation arrives to add to the stack of promos. So where does he come from? In truth for nearly 25 years, Simon has peddled a strain of Gallic prog, mostly evidenced in the Excalibur series of which this is the latest development. He’s also collaborated with the likes of Roger Hodgson (Supertramp) although remaining an essentially Franco phenomena. Excalibur IV is an ambitious project which brings together – virtually – a cluster of “name” musicians to add credibility. So we get John Helliwell (Supertramp) on saxes, Martin Barre on guitar whilst Michael Sadler (Saga), Bernie Shaw (Uriah Heep) and Moya Brennan (Clannad) add vocals on various tracks. Tull/Barre fans should be warned, though, that Martin doesn’t let rip and his contribution should be viewed as supportive rather than centre stage. Even on a couple of excellent instrumentals. There is a gentle Celtic theme underpinning the project as you might expect and reinforced by the presence of both Brennan and the legend and fellow countryman that is Alan Stivell. This entry was posted in ALBUM REVIEWS, ALBUM REVIEWS (Mobile), All Posts and tagged Alan Simon, album, Celtic, Clannad, Excalibur IV, Jethro Tull, John Helliwell, Martin Barre, Moya Brennan, prog, progressive, review, Sonja Kristina, Supertramp, The Dark Age Of The Dragon. Bookmark the permalink.